About Taken March 23/10 in light rain. At the Lynde Creek Conservation Area near Ajax Ontario. I went out for a little while prepared for rain. Nothing out but a few ducks. Then just as I was getting ready to leave, my wife pointed out this guy low in the trees. At first he wasn't real cooperative, hiding in the branches. Then, all of a sudden he flew closer to me and turned into a Supermodel! Very curious of me and my camera. Only a young one would do that. Nikon 300mm f4 afs with Nikon afs 1.4 tc 420 fl, monfroto monopod. Very well lit , great details and of very original colors, thank you my friend for sharing it and wishing you all of the best. I have had a couple of experiences similar to this where a large bird is still young enough that they haven't developed a fear of humans. Once, with a young Bald Eagle, when I was in a kayak, and another time with a young Great Blue Heron. This curious "teen-aged" hawk almost made me feel guilty for being so close. I took most of my shots without flash, because I didn't want to frighten him away. Once I had some decent shots without flash, I took a chance with the flash from about 40' away and this was the result. I figure in a few weeks he will be just as uncooperative as all the other grown up hawks out there. Great shot Andre - lucky you to get such a willing volunteer! Great use of the flash to pull the life out of his eye and the detail out of the feathers... Well done. Thanks for visiting my portfolio and the comment David. Glad you like it. Come back any time for another visit. Thanks for the visit and comment Carol. I felt very fortunate that he let me get close enough for some decent shots. He was a great poser, and gave me a lot of different positions to shoot him in. As for the winking, he almost seemed freindly at times, but that was probably just my imagination. Don't you just love how the major brewerys like to promote their super low alcohol content beer as a "good thing". I can imagine the sales and marketing meeting. "Let's mix our 5% with water and call it Premium Lite, and charge them more. They will never no the difference." Thanks very much for your comments and support Nanda. I think he winked at me! Awsome shot, Hes Beautiful! I love micro-brew beer. 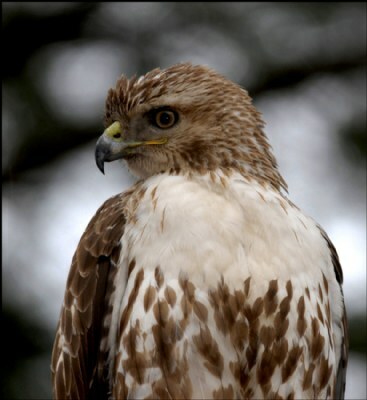 I think it is Endicino that makes a Red-tailed Hawk. I had one a few years ago and there was a label on it what read: "Warning 8% alcohol," I told a friend and he said, "That's not a warning, that's an invitatin." The beer was almost as good as this shot. Excellent shot dear Andre, dertails, clarity.